We went from cold weather to 77 degrees then on to two 85 degree days here in Southwestern PA.
Those two days felt like July, and were hard to adjust to. Rain is moving in and we’ll have a cool off and more spring-like temperatures. Pit Bulls just love to jump! 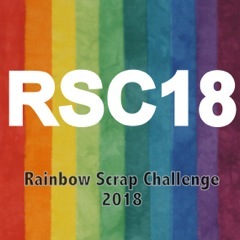 See what other Rainbow Scrappers are up to at So Scrappy on Saturdays and join us Slow Stitchers at Kathy’s Quilts on Sundays. While I’ve been good about keeping up with some of my projects that follow the Rainbow Scrap Challenge color of the month, I’ve lagged behind on this one. Back in January I chose a block and decided to title the project as “Blend”. Well, the RSC color for February was purple, and March’s is green. And while I did work on some purple and green things, they were not any “Blend” blocks. Finally I have gotten around to a purple one and quite late, though I had the fabric pulled for three of them ages ago. And what’s been distracting me so much is the EPP Starflowers project that I’d started on a whim and they are addictive for some reason. I completed a gold one, have begun connecting some more and am working on another. I’ll probably be working on finishing that one up and possibly more connecting work for Slow Sunday Stitching. I found everything from heavy snowfalls to spring weather, puppies to kids to quilting to pretty birds. It was a nice visit. You can view it all here : THIS MARCH AND A LOOK BACK.